Forbidden Broadway is luvvie crack. Pricking pomposity is a rich seam of humour and there are few more puffed up targets than the West End. With half a billion pounds (!!!) spent on tickets to the London stage, the West End's collective ego has rarely been this bloated. Corporations hungrily jostle for a piece of the pie and budgets spiral off into infinity as audiences demand ever bigger spectacles. The knock-on effect is a minimisation of risk, theatres clogged with safe investments: safe adaptation translated the safest of safe ways. These are ripe prospects for parody and Forbidden Broadway takes the stage with knives sharpened. The night functions as a 'roast' of the West End, parodying specific productions and personalities with a series of musical numbers. There's a big hurdle to overcome in parodying West End shows, namely that you really need some serious talent to cover the standard West End songbook. So it's fortunate that Forbidden Broadway has one of the talented quartets you'll see in the West End right now, parody show or not. Christiano Bianco, Anna-Jane Casey, Damian Humbley and Ben Lewis display a frighteningly accurate talent for chameleonic transformation. One moment they're squeaking about the stage as Matilda Wormwood, the next they're raucous, yelling soldiers or a manic, sequin-encrusted Liza Minelli - their individual personalities shining through the myriad characters. The success of Forbidden Broadway lies in its ability to make you laugh at references you don't get. To fully appreciate everything here you'd need an encyclopaedic knowledge of not only the current productions of the West End stage, but the professional culture humming away backstage and the last 50 years of musical theatre here and in New York. For example, there's a number devoted to the ego of producer Cameron Mackintosh, the radio gossip of Elaine Paige and the staging preferences of Trevor Nunn. There is a knowledge barrier to entry, but it's set mercifully low. I go to the theatre in London a couple of times a week and at least a third of these gags went straight over my head - but I still laughed. A pinball fast ricochet momentum builds up, the cast pinging off each other and quickly achieving a gags-per-minute speed that beats damn near anything else on the London stage. Not all of them hit equally, but between the curtain's rise and fall you'll spend more time laughing than not. Personal highlights were a vicious piss-take of the zombie-like Miss Saigon, compressing the plot into a half-baked splodge of melodrama. It's here that Forbidden Broadway's skills are most keenly felt; the ability to peel away the layers of pretension to poke fun at the core of a musical, picking precise, perfect moments to parody. In mocking the questionable racial politics of the show it flies pretty close to the bone in terms of taste, but does so with enough confidence and verve to get away scot-free. Another bright spot was a takedown of Once, a show I haven't even seen (but from what I've heard fully expect to despise). We get right to the heart of things from second one; the stage filling with cheeky, cheery accordion playing Irish folk types singing about potatoes and Lucky Charms. It's hardly the most cerebral attack, but the bluntness pays off. This is also the one point in the play where the cast crack up themselves, their enjoyment infectiously transmitting to the crowd. There are a few moments where not knowing the subject of parody begins to affect the humour. Throughout the show there's playful caricatures of various divas - some of whom I was familiar with and some of whom I'd only vaguely heard of. See Me on a Monday jabs at the singing skills of Bernadette Peters and, to be honest, I don't know a huge amount about her other than that she's a famous Broadway star. It's in numbers like these that the Broadway origins are exposed. Obvious care has been taken to pick sketches relevant to the London stage, but there's the odd exception that doesn't work as well as the others. A duet between two bitchy Spanish stars of West Side Story is more likely to confuse London audiences than entertain - I had no idea who either of these women were. On a similar bent there's precious little material here that's exclusively London focussed - I was craving takedowns of flops like From Here to Eternity, I Can't Sing! or Viva Forever! But these are quibbles rather than genuine complaints and it seems churlish to complain that my particular bugbears weren't catered for. The key to Forbidden Broadway's success is that underneath all the acid wit and pitch-perfect comedy it's built on a bedrock of love the medium. It mocks because it wants the stage to improve and grow, the real bile reserved for mediocrity and neverending productions (mocking Les Miserables with Ten Years More!). The frequent insights into backstage politics, the process of prostituting your talent in crappy shows, and the simple boredom of being stuck backstage waiting for your part means the show attacks from a position of experience, insider authority always shines through. 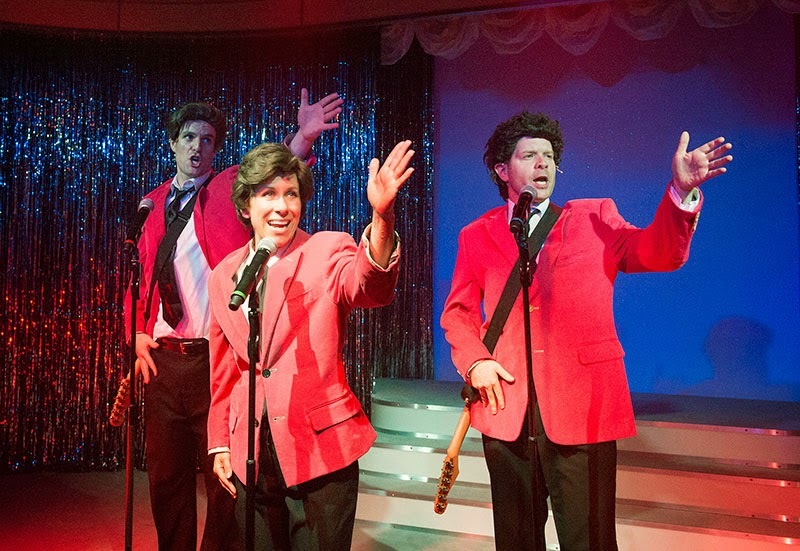 Forbidden Broadway is deeply funny, whip-smart and superhumanly energetic. Honestly, my review could be as simple as this: "I laughed and laughed and laughed". Top stuff. 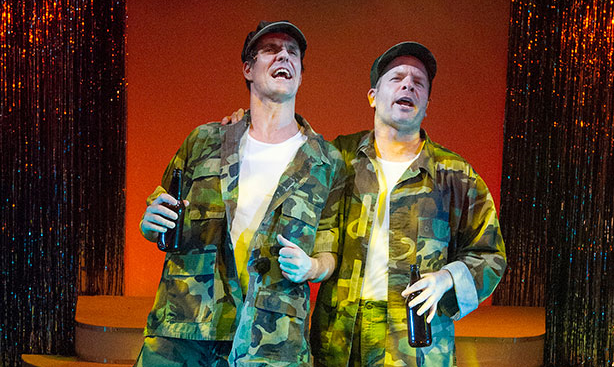 Forbidden Broadway is at the Vaudeville Theatre until 22 November. Tickets here.